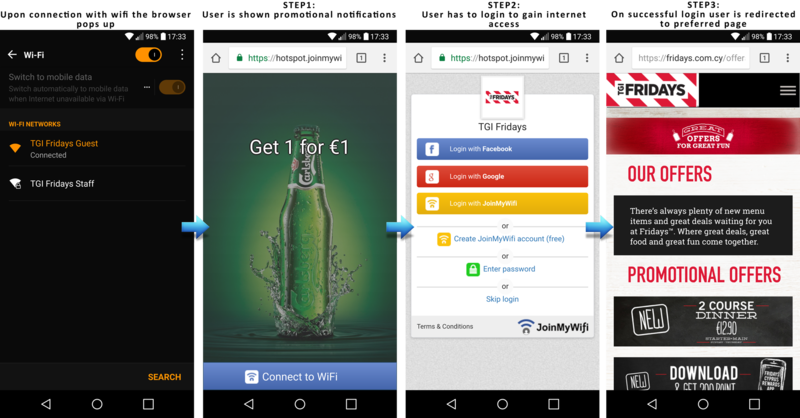 JoinMyWifi uses captive portal technology to give internet access to Wi-Fi users. Captive portal is a very common technology which is used in major malls, hotels, airports and generally in large public and private Wi-Fi networks. When captive portal is in use, customers have to login via the browser to get internet. This process has different amount of steps for users depending on each business’s configuration. JoinMyWifi has a simple and highly customizable flow. You can see a typical flow below. JoinMyWifi makes guest Wi-Fi easy with social logins, credentials and other authentication methods.